A lot can be learned about Brooklyn’s Wakey Wakey! by considering the following anecdote from last Wednesday’s show at Rock Shop. 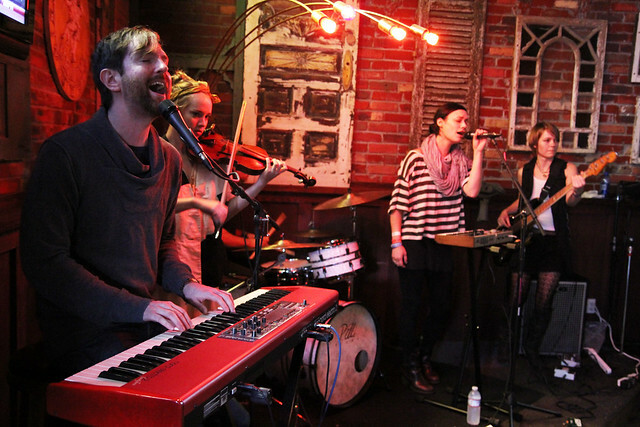 It was the third song in their headlining set, following an outstanding set from tourmates Jukebox the Ghost. 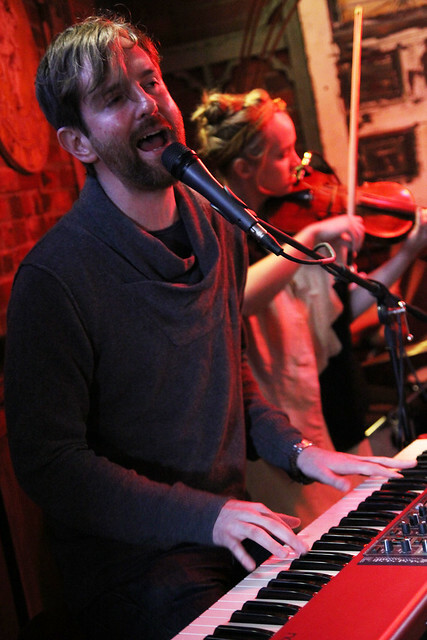 Keyboardist/vocalist/frontman Mike Grubbs dismisses the band from the stage and launches into a quiet solo number. As he sings the first line, peals of laughter erupt – he is covering Madonna’s Cyndi Lauper’s “Girls Just Wanna Have Fun.” But what is more surprising and refreshing about this tour staple is the fact that Mike completely transforms the song, finding a sad, wistful undercurrent to what has to be one of the most bouncy, ridiculous songs of the 1980s. Plus, he just sings the hell out of it. With folk/pop music like this that can at times veer into melancholy territory, that very lack of self-seriousness, and the willingness to have fun, are essential ingredients. This set – a homecoming for the band after a long tour – was strong throughout, with Grubbs and his bandmates on-point musically and loose with the crowd, having fun with this intimate group before their big night at Bowery Ballroom the following evening. This show was so intimate, in fact, that one couple got a chance to talk to Mike about how they got engaged just before the show! I recorded this set from our usual location in the venue with the DPA microphones and an outstanding soundboard feed from the house engineer, Shane. The quality is outstanding. Enjoy! Direct download of FLAC files [HERE]. Tags: acidjack, brooklyn, DPA 4021, family records, gowanus, park slope, rock shop, sound devices usbpre2, wakey wakey! Acidjack apologizes for his temporary 80’s popcult brain freeze.